Take a tour from Madrid and discover these two unique cities with outstanding Roman monuments as the Aqueduct, Gothic Quarter and many other unique landmarks which brings you a full vision of the most traditional Spain. The first stop will be Segovia. The city of Segovia is rich in historical monuments. The old Roman city, still preserves the magnificent Roman Aqueduct from the time of Emperor Augustus. See the elegant Cathedral, and its Alcazar fortress, which is known as one of the most spectacular castles in Spain. 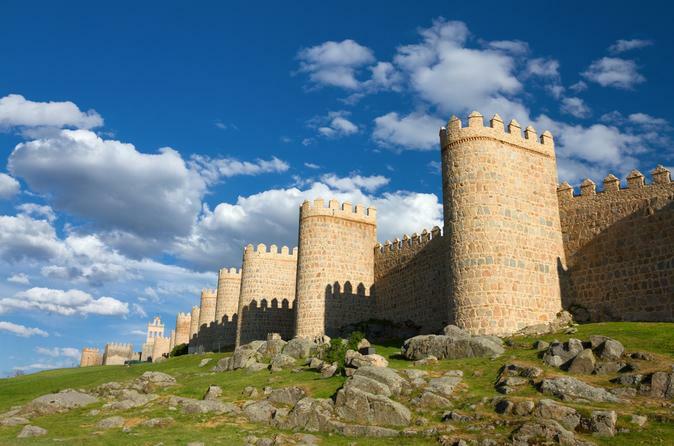 Ending the tour you will discover, Avila is one of the oldest cities in Spain, surrounded by very well preserved medieval walls from the XI century, resembles rather an immense castle, and it is the best sample of a fortified city. The old quarters has Romanesque churches, Gothic palaces, and a XII century Cathedral. The city is the birth place of Ste. Therese, source of the Spanish Catholic mysticism. Visit the outskirts of the Cathedral, the Romanesque Basilica of San Vicente, Mayor Square, and go on a brief walk through its old streets to see the Convent of Ste. Therese.